Kombucha is a fermented beverage with huge health benefits, while also being a simple and low maintenance DIY home project. Originating in the far East around 2,000 years ago, kombucha was known by the Chinese as the 'Immortal Health Elixir'. The health benefits kombucha provides include improved digestion, cleansing and detoxification, immune support, reduced joint pain, and cancer prevention. During the fermentation process, kombucha slowly turns to a carbonated vinegar, and becomes infused with b-vitamins, enzymes, and probiotics. The fermentation occurs from a symbiotic colony of bacteria and yeast commonly known as a 'scoby'. This fermentation process is perpetual, and the longer you leave your kombucha un-drunk the more vinegary it will become. Personally I like my kombucha to be very vinegary, but you may prefer to drink your kombucha early in its fermentation so it retains a more sweet flavour. Want to share your own recipes? as desired then remove tea. IMPORTANT: The video above uses loose tea leaves, only follow this if you have an appropriate container that allows the leaves to steep. Tea leaves MUST NOT escape the steeping container and freely float in the sugar tea mixture. If these leave interact with the scoby, they will potentially contaminate the scoby. Allow water to cool to room temperature. Pour tea into sterilized container, add scoby, and tie cloth of lid. Allow tea to ferment for 7-14 days depending on your climate, and the degree you desire your kombucha to have a sour vinegary flavour. The hotter the climate the faster the fermentation will occur. 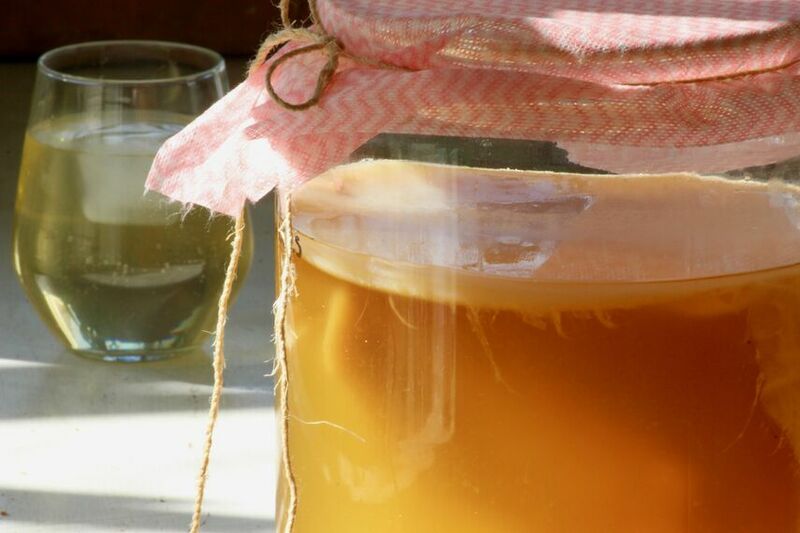 This Kombucha recipe uses a single batch system, as opposed to a continuous brewing system. Having said that, the process for making the sugar tea is the same for both systems–the continuous system simply uses a jar/container with a tap attached. IMPORTANT: make sure the jar/container used is made of glass and properly sterilised. I suggest submerging the glass jar/container in boiling water for over 10mins prior to use.